Molly Marcello takes us on a tour of the new facility in Moab. 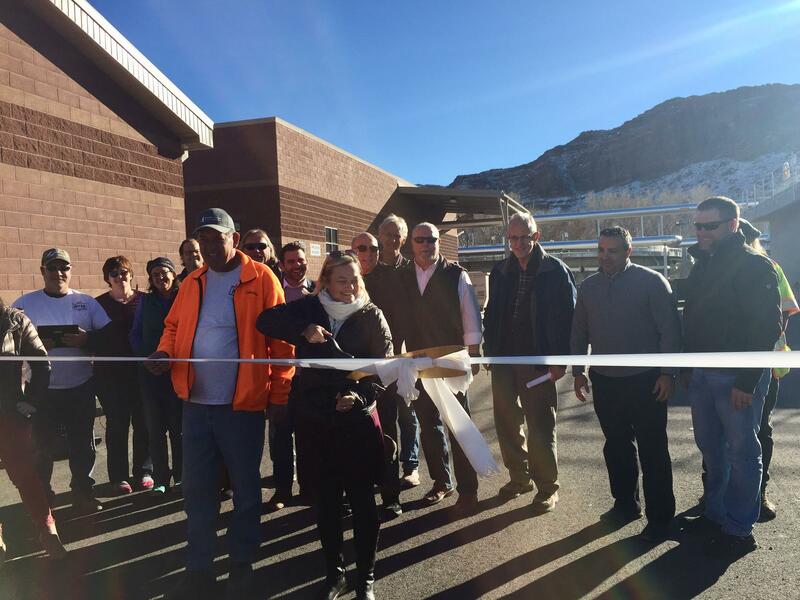 Moab citizens celebrate the opening of the new facility. When you take a shower, wash the dishes, or do anything else that might require a drain, where does all that material go? Every flush in the Moab Valley now makes its way through the sewer system to a brand new, state of the art wastewater reclamation facility. The new reclamation facility sits a half mile from the Colorado River, right across the street from where the old sewer plant used to be. But officials agree that the new reclamation facility is unlike the old sewer plant in many ways. State and federal officials often found the 1959 facility in violation of its permits. Two years ago, a group of engineers studying the issue said that Moab simply had too much material coming in for the 60-year-old plant to handle. That means treated wastewater going out of the old plant and into the Colorado River, often did not meet compliance standards. A new plant, of course, costs money, and Moab City received a loan from the Utah Department of Environmental Quality to fund the $14.5 million facility. City reps say that loan will be repaid using impact and sewer fees. Both will rise over a period of five years to pay it off. City officials say it’s well worth the cost to have a functioning facility, one they say will last decades into the future. Earlier this month, about 50 people – from curious neighbors to engineers, city leaders, even a group of sixth graders gathered at the new facility to celebrate with a ribbon cutting. Fosse expects the new reclamation facility to handle any new growth in the Valley, plus increases in tourism. He has confidence in the facility’s bacteria and his ability to manipulate them. “They basically refer to operators of plants like this as bug farmers – we have to keep the bugs happy or they die,” Fosse said. Although the technology might be new when it comes to this particular facility, Fosse said the basic concept of waste treatment still comes down to bacteria. With a new facility, Fosse now has total control over those bugs, as he says. He can manipulate giant blowers to move air through the treatment system and stimulate a process called aerobic digestion. In the middle of winter, aerobic digestion will slow down due to cooling water temperatures. But, there’s also not a lot of visitors to Moab right now, meaning not a lot of material to process. When it’s the spring and summer, sewer drains can get pretty busy in the Moab Valley. There are only about 10,000 permanent residents in the county, but officials records millions of people visit nearby national parks each year. Fosse doesn’t actually need to leave the facility to know if it’s busy in town. It will likely take a full year of running the new facility to understand just how it performs during a change in the seasons – meaning both weather and tourism. Fosse said the true test of its performance will be during one of Moab’s busiest weeks of the year when all 3,000 plus rooms are booked in the Valley.